Hello Tampa! Lisa here with an update on some Arts and Culture in Tampa Bay! The Carrollwood Cultural Center will be hosting a free art lecture titled "The History of Art as a Function of Technology and Social Power." The guest lecturer will be artist Brad Bannister, and this lecture will take place on Thursday, February 10th at 7pm. The lecture will focus on the purposes of art through history, natural versus man-made materials, techniques, elements of principals and design, style, recorded history of art, and art as a function of social, financial and political power. Bannister earned his bachelor&apos;s degree from Missouri State University, a RN diploma from De Paul Hospital School of Nursing and a Master of Science in Guidance and Counseling again from MSU. Wow that&apos;s an impressive background! In his younger days, Bannister made frequent trips to the St. Louis Art Museum with his father, where he became an admirer of Max Beckmann. Bannister&apos;s uncle has been his strongest influence as he was the former Head of Art and Architecture at Atlantic Christian College in North Carolina. 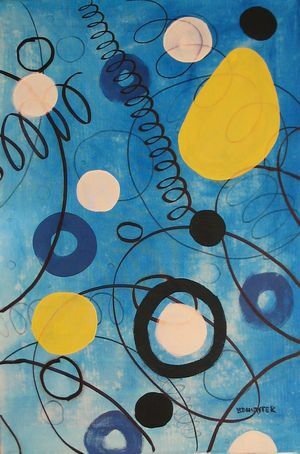 Bannister uses a mixture of acrylics and mixed media in his work, which is abstract and nonobjective. "The History of Art as Function of Technology and Social Power" is part of the Center&apos;s art lecture series that will continue through February. That&apos;s all for now, but stay tuned for more Things To Do In Tampa, and other Tampa Bay Area Events!